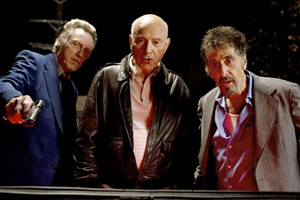 Putting Christopher Walken, Al Pacino and Alan Arkin into the same movie raises a large amount of justifiable expectation. None of these veterans have worked together before, and it’s reasonable to assume that the cumulative weight of their old-pro experience will deliver the big-screen goods. Unfortunately, Stand Up Guys — the story of aging mobsters forced to come to grips with their mortality — only partially lives up to the promise suggested by its powerhouse cast. As directed by Fisher Stevens, from a script by Noah Haidle, Stand Up Guys finds its best moments in the relationship between Pacino and Walken, as a couple of bottom-feeding hoods who inhabit the lower echelons of the criminal subculture. Walken’s Doc, who spends most of his time painting pictures of sunrises, refers to himself as a “retired” man. He lives in a modest apartment. His hell-raising days appear to be done. He’s proud of the fact that he has cable. Hey, at a certain point, you take your pleasures where you find them. A low-key drama begins when Pacino’s Val (short for Valentine) is released from a 28-year stretch in prison. Val’s the movie’s most “stand-up” guy because he served his time without ratting out any of his cronies. Walken’s Doc meets Val upon his release. The two hug awkwardly, and the movie proceeds to chart the next 24 or so hours in the lives of these aging felons. Looking to party after his long prison stint, Val visits a local brothel, only to discover that he’s unable to function sexually. Doc proposes a Viagra solution — which leads the two to break into a pharmacy. Hirsch, we learn, is languishing in a nursing home where he’s suffering from emphysema. To add some proverbial insult to the injury of age-related decline, a vicious mob boss known as Claphands (Mark Margolis) wants Val assassinated. The screenplay eventually gets around to telling us why Val has become a target, while making room for Val and Doc to rescue Arkin’s Hirsch from the nursing home where he’s pretty much relegated to sitting in his room. Arkin’s Hirsch gets an opportunity to ply his trade as the trio races from the cops and lands in a variety of other jams, not the least of which involves a naked woman (Vanessa Ferlito) they discover in the trunk of the car they’ve stolen. They become the woman’s self-appointed protectors. They also visit Doc’s favorite restaurant where they’re waited on by Doc’s favorite waitress (Addison Timlin). I wouldn’t say that either Walken or Pacino is in peak form, but they work work well enough together — with Walken playing the more restrained of the former hoodlums. Walken and Pacino keep the movie watchable, even though the story — punctuated with well-selected ’70s R&B — doesn’t generate much tension. If you’re inclined to think about what might have been accomplished with this kind of cast, Stand Up Guys may prove disappointing. If you’re willing to settle for watching Pacino and Walken enact a bromance for seniors, you may be entertained enough to stave off regret. I was.